Get to know the "teams" you'll be playing with in-game. 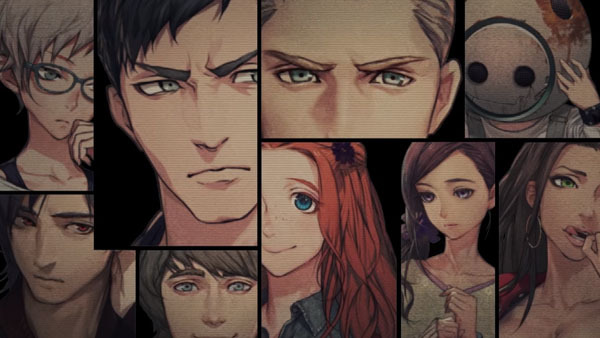 Spike Chunsoft's Zero Time Dilemma is hurtling toward release on June 28 in North America with a Japanese release on June 30 (weirdly enough), and the third volume of the Zero Escape trilogy is looking pretty awesome. The latest trailer introduces players to some of the characters you'll be playing alongside during the game. There's Carlos, Akane and Junpei on Team C, Q, Eric, and Mira on Team Q, and Diana, Phi, and Sigma on Team D. There's a dog named Gabu left over (adorable puppies in video games!) and Zero as the mastermind of it all. Zero Time Dilemma is going to be releasing on both PS Vita and Nintendo 3DS this summer, so if you've been following the rest of the Zero Escape series, you'll be able to continue playing on the platform of your choice. And if you're new to the series, this is definitely a good time to get started, though I'd recommend playing through the original game first even if only to get a feel what you're up against. If you dig devious puzzle-solving and plenty of crazy solutions with an engaging storyline, you'll be right at home here.